My favorite pie turned macaron. I love how the pecans smell when these Derby Pie Macaron come out of the oven. 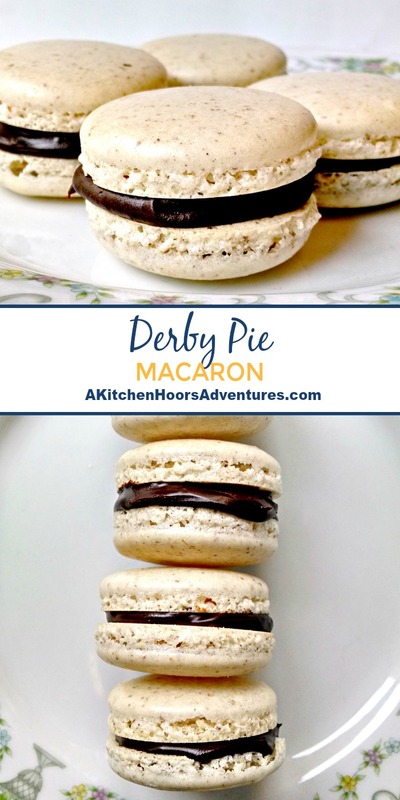 These Derby Pie Macaron are the last of the two types that Mom and I made. They’re the more traditional version macaron; sweet. I flooded work with macaron for a good couple of days. Some people missed the pizza ones because they were out on that Friday. One of those “people” is S, a colleague who LOVES it when I bring in macaron. She loves it so much, she sent a text to her sister bragging about it because her sister, I think, has tried to make them? But has just given up and now just goes out and buys them. She sent me the first one, which I thought was hilarious but then she sent me the second one a little later. S wasn’t here on Friday to try the pepperoni pizza ones, so I brought in the fixins and whipped up a couple for her and for A, my boss, who wasn’t here to try them either. I did bring in the rest of these Derby Pie Macaron for people to sample. I don’t know about you, but I love the mix of chocolate and bourbon, so it was difficult for me NOT to snarf the whole batch of ganache down as I was piping it onto cookies that morning. For those of you who DO NOT know what Derby Pie is, Derby Pie, in my house, is short for Kentucky Derby Pie. Imagine a delicious pecan pie. Now add semisweet chocolate ships and some bourbon. Oh yeah. It’s THAT GOOD! It’s so good that I wanted to try to capture those flavors in these macaron. The trick I learned from the class about making your own nut meal; freeze the nuts before you try to grind them. My own trick? Add some of the powdered sugar to the food processor. Even though my pecans were frozen, they still started to have the look of nut butter. So, I remember from my first attempt at pistachio ones that I added the powdered sugar when I processed them and that helped. IMMENSELY! Next on the list? Possibly macadamia nut….stay tuned. We could honestly smell the sweet pecan aroma as these babies came out of the oven! I know I undercooked one try slightly, so I let them sit a little longer than usual before filling and bringing them in to work. It was not easy seeing them laying there and not eating them. Honestly. They smelled so delicious! And DSD, A, said they were very good! Mom and I did sneak a few as she was packing up to leave. YUM! The chocolate, the bourbon, the pecans. They really did have the flavor of Derby Pie! Just look at those pretty feet and that tasty chocolate. YUM! Honestly, just get in the kitchen and try them already!! I’ve said it before and I’ll say it again. Even if they don’t turn our perfect, they’re still going to taste delicious!! Place the frozen pecans in the bowl of a food processor with 1 ounce of powdered sugar. Process until the pecans are ground into a fine powder. The addition of the powdered sugar should help the pecans grind up fine enough. Add half of the almond meal and half of the remaining powdered sugar; pulse until combined and processed. Sift into a large bowl and repeat process with remaining almond meal and powdered sugar. Sift the mixture two more times and set aside. Sift 1/3 of the almond mixture into the bowl with the meringue. Fold the ingredients together with a large spatula until incorporated. Continue sifting and folding until all the almond mixture is incorporated into the meringue and the mixture should drip slowly off the spatula; like lava flowing. Transfer the batter to a large piping bag fitted with a 1/2" tip and pipe 1 1/3 inch rounds onto a silpat covered baking sheet. There are several different templates out there. Two that I liked are here and here. You’re going to LOVE this next part! Once all the batter has been piped or your sheets are full, grab the edges of the pan, secure the silpat with your thumbs (or any extra batter) and rap the pans on the counter. This releases any remaining air bubbles in the meringue. Continue rapping the sheets, turning occasionally, until no more air bubbles surface. Allow the macaron to rest on the counter at least 30 minutes. Once they’ve rested and the tops are no longer sticky to the touch, bake at 325 for 5 to 7 minutes. Rotate the pans front to back and top to bottom and bake an additional 5 to 7 minutes. Do the wiggle test to see if the meringue is cooked. Carefully grab the top of the shell and if it moves easily from side to side when wiggled, indicating the meringue isn’t completely cooked, then continue to cook in 4 to 5 minutes intervals until they no longer wiggle. While the macaron cool, make the ganache. Microwave the chopped chocolate and half in half in a microwave safe bowl for 1 minute. Stir and then continue to heat in 30 second intervals until the chocolate is melted. Add the bourbon and stir with a whisk until combined. Pour into a pastry bag fitted with a round tip and cool until thickened. Pipe a dime sized round of ganache onto a macaron and top with a second macaron; making sure to match the size and shape of each pair. Also there is no amount listed for the cream of tartar. I put 1/4 tsp and I got very stiff whites very quickly. It’s a pinch of cream of tarter. Hi there – I am making these right now for a Kentucky Derby party. In your recipe instructions, it mentioned adding granulated sugar to the egg whites, but granulated sugar is not mentioned in the ingredient list, FYI. From other macaron recipes, I am guessing 1/4c, but just so you know, that info is missing! Excited to have these! Thank you! Guess I rushed through that one. Good guess on the sugar, though! I am excited to make these for a derby party tomorrow. I did notice that in the directions you mention to add granulated sugar to the egg white mixture once a foam forms. In the ingredients I did not see granulated sugar noted. Could you advise how much to use?!!! Thank you for your help! Sorry about that! I fixed the directions. Aargh! I’m in the middle of trying the recipe and it says to add cream of tartar and granulated sugar to the egg whites, but there are no amounts listed in the ingredients. This is the first time I have tried making macarons so I don’t know what the standard amounts per egg white are. Please correct this post!!! Your macarons look sensational. I’ve always meant to try my hand at them too and your encouragement was what I needed. I hope you do try them! These look amazing- I adore pecans but am afraid to try making macrons- can you use parchment or does it have to be on a silpat? You can use parchment. They make take a little coaxing to come off so just be patient. At least they did when I attended the Sur La Table cooking class. I just have a TON of silpat going back at least 20 years when they first came out. And I get at least one new one a year when I participate in #BrunchWeek. I wouldn’t say no to one or two of these little beauties…or maybe a dozen!!! They look fantastic! Thank you! They smell amazing baking. The kitchen was filled with pecan flavor. I never had the nerve to try macarons. I love your tips though. Maybe…..I might try some! I hope you do! They’re not that difficult. And if you try and have issues I can pretty much trouble shoot everything. I’ve had it ALL happen to me while baking these. I haven’t yet conquered macarons (tried twice and failed) so I love the tip about freezing the nuts and adding a bit of powdered sugar. Totally going to make them again and see if they come out better. Liz, email me your fails! I can help figure out what went wrong. I love that you’ve tried them, though. I want to help you succeed!! Once you nail them, you’ll be addicted to baking them like I am. They smelled amazing coming out of the oven, Dini. You have to try them! These look amazing oh my gosh! I love the tip about freezing the nuts first, I'm going to try that one – I'm lazy and usually buy almond meal to make regular macarons but I'm planning to make hazelnut ones soon so will have to grind my own. I also use the trick of adding some sugar when grinding, seems to work! Michelle, I leanrned that from Sur le Table class I took; especially with nuts with high fat content. I tried it with the peanut ones I made and it worked like a charm! I’m going to try macadamia nut ones at some poitn. This is SO SO creative! They look awesome and I love the nut trick! I am definitely trying that! Glad to have them linked up at Foodie Fridays! These may be my favorite out of all of your macarons so far. Because, well, chocolate, bourbon, and pecans! Love macaron and these look delicious! LOL, Jess. I just purchased the clam shells to ship them so I can send some to Mom. Derby pie is our favorite. I need to get brave and try to make macaroons. You should try them, Jennifer. They're finicky but well worth the time! You will feel so accomplished them they come out. Your macarons are lookin' good! It seems you have perfected how to pipe them! Amber, the piping, for me at least, is the easy part. Just keep the tip low to the mat and squeeze until they reach the ring of the circle, then lift straight up! Sometimes, like the strawberry ones, had tips. I just wet my fingers and patted those kiss like tips down with my fingers.